TAMPA, Fla. — Since losing the series opener at home, the Tampa Bay Lightning have won three straight to put the Boston Bruins on the verge of elimination. And yet the only thing the hockey world can talk about is Boston’s Brad Marchand licking Tampa Bay’s Ryan Callahan — on the face, during Game 4, like an ice cream cone — and what should happen. Callahan asked after the game what the difference is between licking someone’s face and spitting on them, pointing out that the penalty for the latter is a game misconduct. Lightning coach Jon Cooper said there’s no place for such an act in hockey. Call that a tongue-lashing, if you will. The good news for the Lightning? 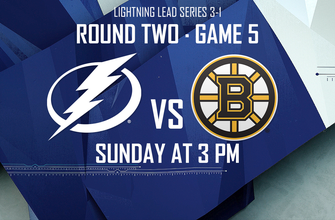 They return home for Game 5 on Sunday afternoon at Amalie Arena with history on their side, No Lightning team has ever blown a 3-1 lead in the playoffs, and the Bruins are 0-23 in series they trailed 3-1. The series has gone back and forth, just like Friday’s game, which saw the Lightning jump ahead 2-0, only to have Boston rally back for a 3-2 lead. Steven Stamkos, held in check for much of the playoffs, came through with a huge goal to tie the game late in the third period, and Dan Girardi redirected an Alex Killorn shot in front of the net for the game-winner in overtime. The LickGate fuss has obscured some key points to the Lightning turnaround. Boston hasn’t scored an even-strength goal in the last two games, and the Lightning have continued to score despite the Bruins effectively containing Nikita Kucherov and Stamkos for much of the series. And for all of Tampa Bay’s momentum, there’s a keen realization that nothing is of consequence without another win. Boston must try to stay alive without arguably their best defenseman in Torey Krug, who injured his ankle in a Game 4 and will miss the rest of the series. Nick Holden will step into his role Sunday. The Lightning’s quick dismissal of New Jersey in the opening round gave them a full week of rest before this series. Dispatch of the Bruins on Sunday, they can rest again, with all the other series going at least six games. L-Carnitine for Athletes: Myth Or Magic?